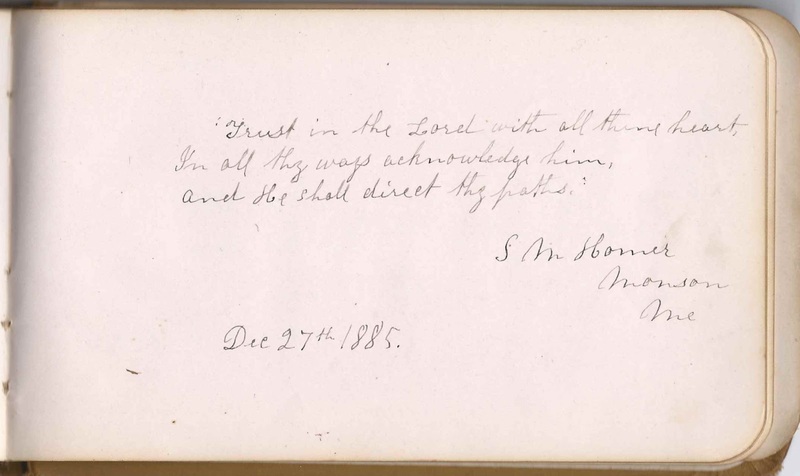 1880s autograph album that was given to Wallace Homer of Monson, Maine, at Christmas in 1880. 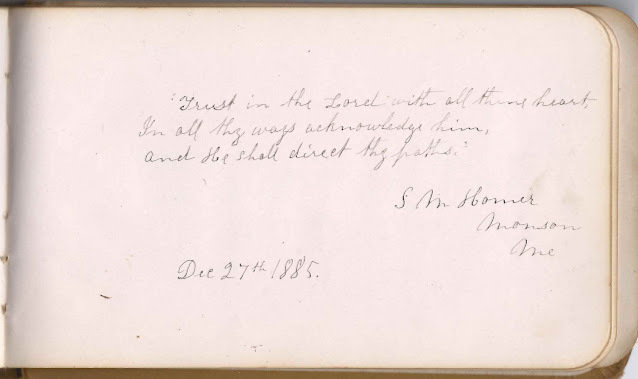 See another post that features a religious book that belonged to a Mrs. Sarah Homer, possibly Wallace's mother Sarah Mussey (Mathews) Homer. 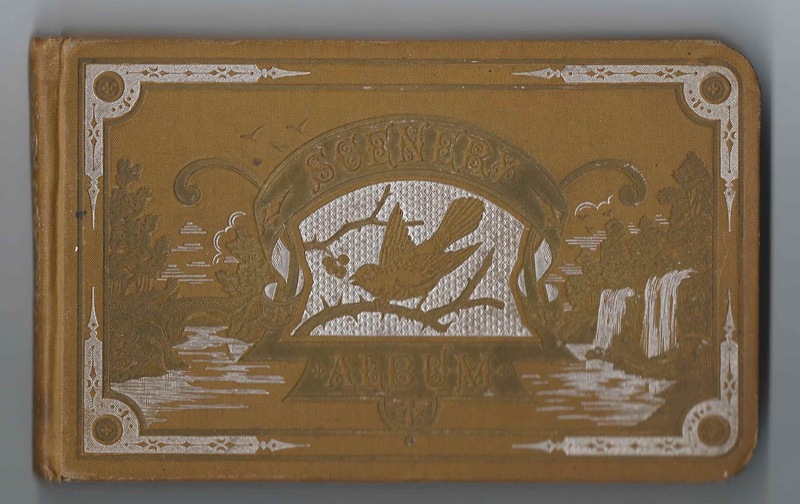 Another post features a CDV and tintype album of members of the Homer and Mathews families and others of Monson, Maine, and other towns in Piscataquis County, as well as photographs of people who moved away from Maine. The album is approximately 7" x 4-1/4" and contains the sentiments of 86 of Wallace's relatives, friends, pastor and schoolmates. 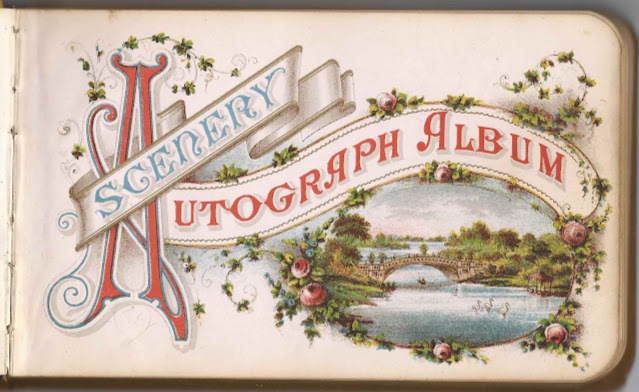 Many of his relatives had dispersed to other parts of New England, the Midwest and West but apparently come back to Monson for occasional family visits and had a chance to sign pages in the album. Wallace Homer was born 29 December 1861 at Monson, Maine, the son of Edward Henry Hoar/Homer and Sarah Mussey (Mathews) Hoar/Homer, who were both born at Monson, Maine. The 1870 Census of Monson gives Wallace's family's surname as Hoar. The "History of Monson, Maine 1822 - 1972", compiled for Monson's Sesquicentennial commemoration, notes that Edward Henry Hoar and his brother James Rudolph Hoar (whose children Lula Homer and Charles Orlando Homer of Galion, Ohio, signed pages in Wallace's album) changed their surnames to Homer about 1874. Duly, the 1880s Census of Monson gives Wallace's family's surname as Homer. Wallace's paternal grandparents were William E. and Betsey (Goodell) Hoar. His maternal grandparents were Elijah and Anna (Bennett) Mathews. A few of the Homer clan and many of the Mathews clan signed pages in the album. The family lived at became known as Homer Hill. I believe the S. M. Homer of Monson, Maine, who signed on December 27, 1885, was Wallace's mother Sarah Mussey (Mathews) Homer. Wallace was listed as single in every Census that I found, but I may have missed something. His niece, Dorothy Homer, born about 1906, daughter of Edward Mathews Homer and Ann Eliza (Pennington) Homer, was living with him at the time of the 1920 Census, and she continued living with him at the farm on Homer Hill, even after her 1925 marriage to Max C. Forbus. Dorothy's mother had died before 1914, when Dorothy's father married again, to Myrtle Estelle Huff. 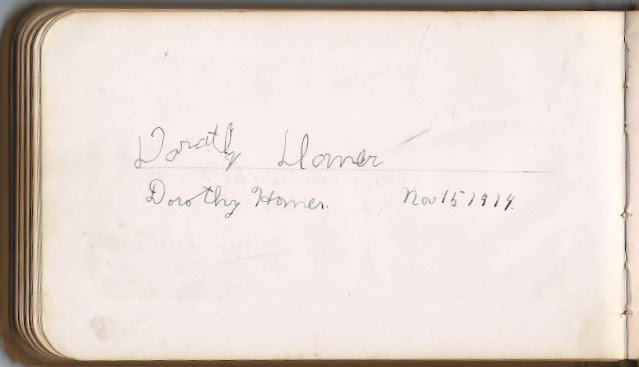 Dorothy signed a page in her uncle's album in 1914. 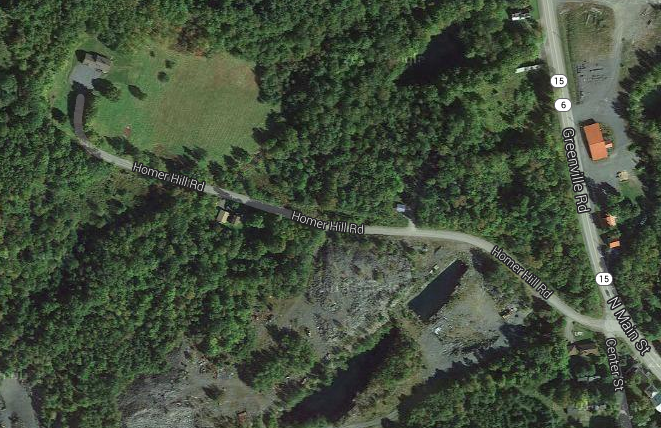 Wallace Homer died at Monson, Maine, in 1952. S. Alice Bull of Waterbury, Connecticut; shared a page with other people; "In memory of Pleasant house, August 25, 1899"
Laura L. Butler of Somerville, Massachusetts; shared a page with other people; "In memory of Pleasant house, August 25, 1899"
Charles Davison, signed at Greenville, Maine, on February 12, 1883. His wife Laura (Tenney) Davison signed the right facing page. Laura T. Davison, signed at Greenville, Maine, on February 12, 1883. She was Laura (Tenney) Davison, whose husband Charles Davison signed the left facing page. Harriett F. Drury of Brooklyn, New York. She was Harriette F. (Lawton) Drury; shared a page with other people, including her daughter Helen L. Drury. "In memory of Pleasant house, August 25, 1899"
Helen L. Drury of Brooklyn, New York; shared a page with other people, including her mother Harriette F. (Lawton) Drury; "In memory of Pleasant house, August 25, 1899"
Mrs. G. W. Edes, signed at Monson, Maine, on January 8, 1882. Presumably Betsey Jane (Lord) Edes, wife of George Washington Edes who signed the right facing page. G. W. Edes of Monson, Maine, signed on January 8, 1882. He was George Washington Edes, whose wife, Betsey Jane (Lord) Edes, signed the left facing page. John R. Flint of Monson, Maine, signed at Monson Academy on January 12, 1882. "Snow blowing like fun"
Lindley H. Folsom of Monson, Maine, signed on January 13, 1882 "your companion in fox hunting"
Louisa B. Hawes, signed at Monson, Maine, on March 11, 1881. Presumably the wife of Rev. J. B. Hawes, who signed the right facing page. J. B. Hawes, signed at Monson, Maine, on March 10, 1881; Wallace's pastor. The Louisa B. Hawes who signed the left facing page was perhaps his wife. Emily Heintzelman, signed September 15, 1891, at 1912 H. St., Washington, D.C.
Lulie Homer, signed at Monson, Maine, on August 22, 1881. She was Lula Homer, daughter of Wallace's paternal uncle James Rudolph Homer, brother of Wallace's father, Henry E. Homer. James, his wife Jane E. (Neff) Homer, son Charles and daughter Lula lived in Galion, Ohio. Charles O. Homer of Galion, Ohio, signed on July 15, 1885. He was Charles Orlando Homer, Wallace's cousin, son of Wallace's paternal uncle James Rudolph Homer and his wife Jane E. (Neff) Homer. 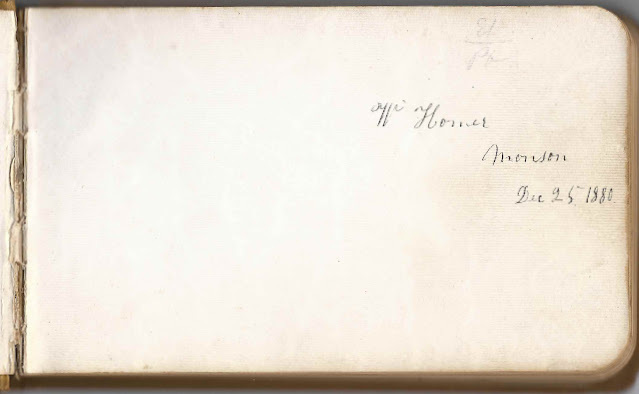 S. M. Homer of Monson, Maine, signed on December 27, 1885. S. M. Homer may have been Sarah Mussey (Mathews) Homer, Wallace's mother. Dearborn J. Jackson of Monson, Maine, signed on October 15, 1915. "Birthday Nov. 29, Born 1899"
Wayland H. Jones of Monson, Maine, signed on January 12, 1882. He was born 9 October 1866 at Parkman, Maine, son of Frank and Susan (True) Jones. Hattie L. Mansell of Monson, Maine, signed on June 11, 1881. Middle initial looks like L. She might have been Harriet (Levenseller) Mansell, wife of Allen Mansell. Sara B. Mathews, signed at Lowell, Massachusetts; Wallace's cousin, Sarah B. Mathews, daughter of Wallace's maternal uncle George Allen Mathews and Ann Jane Morrill (Nutting) Mathews. Sarah signed again on the page, at an older age: Sarah B. Mathews, Auburndale, Massachusetts, June 12, 1896. Colby '96"
Roy Mathews of Lowell, Massachusetts. Also signed the page at a later age as Roy Mathews, Monson, Maine, April 29, 1886. Wallace's cousin, son of his maternal uncle George Allen Mathews and Ann Jane Morrill (Nutting) Mathews. Howard Mathews of Vineyard Haven, Massachusetts, 1901-1915, October 17. Howard Homer Mathews, born 17 October 1901 at Weston, Massachusetts, son of Wallace's maternal cousin Leroy Mathews and wife Hattie (Morse) Mathews. He apparently wrote this in 1915 (he lived far longer). Howard was the grandson of Wallace's maternal uncle George Allen Mathews and wife Ann Jane Morrill (Nutting) Mathews. Howard's brother George M. Mathews also signed a page in the album. J. B. Mathews, signed at Monson, Maine, on January 30, 1881. He was Wallace's maternal uncle, Jonathan Bennett Mathews, older brother of Sarah (Mathews) Homer. He had married Sophia Lucinda Shailer in 1860 and was living at Portland, Maine, with his wife and four children at the time of the 1880 Census. His oldest child, son Shailer Mathews, was out of the household by 1880. Aunt Annie, signed at Monson, Maine, on October 11, 1881. Perhaps Ann Jane Morrill (Nutting) Mathews, wife of Wallace's maternal uncle George Allen Mathews. Shailer Mathews of Portland, Maine, signed on January 29, 1881; Wallace's cousin, who was the son of Wallace's maternal uncle, Jonathan Bennett Mathews and Sophia Lucinda (Shailer) Mathews. George M. Mathews of Vineyard Haven, Massachusetts, signed on August 3, 1912. He was the son of Wallace's maternal cousin Leroy Mathews and wife Hattie (Morse) Mathews, and grandson of Wallace's maternal uncle George Allen Mathews and wife Ann Jane Morrill (Nutting) Mathews. 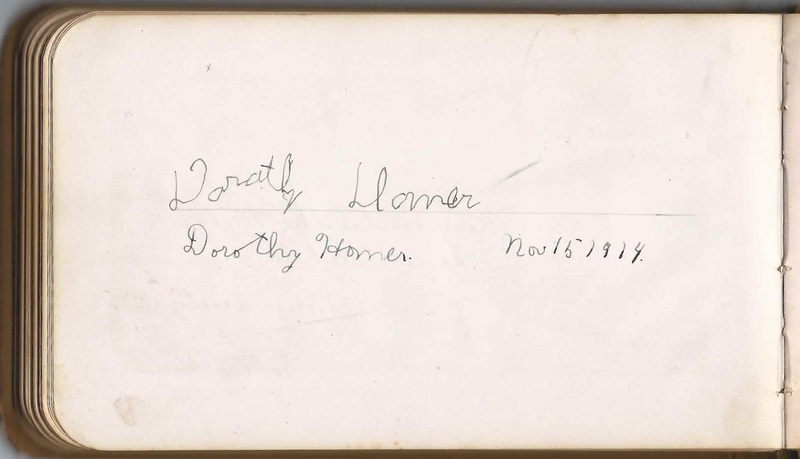 George's brother Howard Homer Mathews also signed a page. Julia F. McDaniel, signed September 1, 1881 [or September 7, 1887 - her "1"s and "7"s are very alike. "Web-foot cousin"
Benjamin M. Philbrick, signed August 4, 1915, Evanston, Illinois, birthday Aug 24. Shailer Shaw Philbrick, Grace Mathews Philbrick and Herbert Shaw Philbrick. Herbert Shaw Philbrick and Grace Elizabeth (Mathews) were married in 1904. Shailer Shaw Philbrick was their son. Grace was the daughter of Wallace's maternal uncle Jonathan Bennett Mathews and his wife Sophia Lucinda (Shailer) Mathews. Barnas S. Shailer of New Gloucester, Maine, West Pownal Post Office. He was Barnas Sears Shailer, brother of Sophia Lucinda Shailer, wife of Wallace's maternal uncle, Jonathan Bennett Mathews. Hattie H. Shailer of New Gloucester, Maine. She was Hattie Hale (Sawyer), daughter of Jefferson and Lydia (Crosby) Sawyer and wife of Barnas Sears Shailer, brother of Sophia Lucinda (Shailer) Mathews, wife of Jonathan Bennett Matthews, who was a brother to Wallace's mother Sarah M. (Mathews) Homer. Sarah Cecilia Sower of Philadelphia; shared a page with other people; "In memory of Pleasant house, August 25, 1899"
There is a possibility that Hattie Mansell is my great grandmother. My grandfather was born in Monson in 1884. However, her middle name was Myra. In the 1880 census it says she was 13 years old. She married Alphonso E. Bartlett. Seems like the L.F. Bartlett must be a relative also, but couldn't see anyone in my records that has the exact initials.